In 2017, Matt Griffin and Lizabeth Arum of Ultimaker, and Chip Bobbert of Duke University, founded the inaugural Construct3D conference: a 3D printing, digital fabrication conference, and expo focused on academic use, best practices, and professional development opportunities for faculty, staff, and students. It was held at Duke University on May 5-7, 2017. 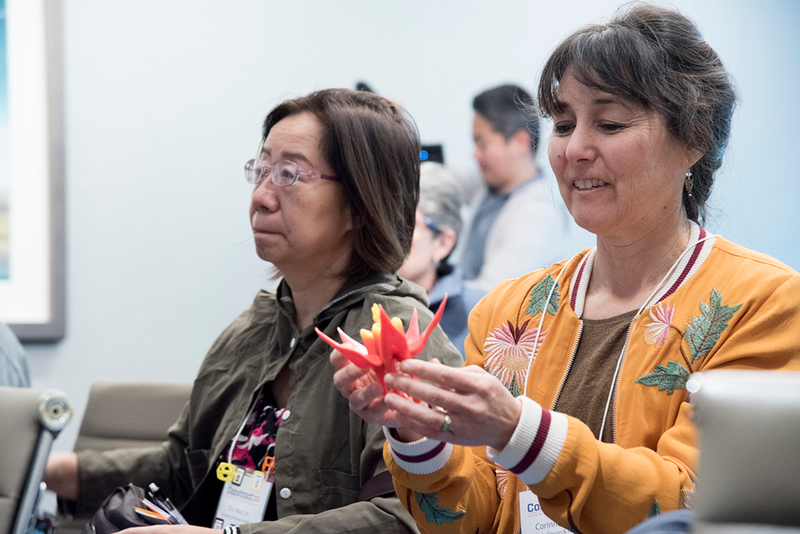 Passionate, curious educators and innovators from informal, K12, and Higher Ed contexts came together to exchange ideas, build their networks, learn new skills, and accelerate the adoption and exploration of 3D printing in education. The conference hosted panels featuring notable educators and industry experts. We also had over one hundred talks and workshops, a vendor area offering demonstrations of leading design, materials, digital fabrication technologies and other resources, and social gatherings that encouraged discussion. Bookending the past two conferences, we provided in-depth workshops led by core trainers from Autodesk, Rhino, and Shopbot. These popular sessions not only offered educators new skills to take home to their schools and programs, but were also opportunities to speak directly to staff central to the development of these platforms. Our plan for 2020 is to extend these offerings even further. We will be hosting professional trainings and learning opportunities in the Houston area on February 13 and 14, 2020, while the heart of the conference (talks and workshops led by educators and students) will take place on February 15 and 16, 2020. Larry Rosenstock, CEO and founding principal of High Tech High, a network of thirteen K-12 public charter schools in California focused on project-based learning, and is President of the High Tech High Graduate School of Education. He holds a JD from Boston University Law School, an M.Ed from Cambridge College, a BA from Brandeis University, and a Doctor of Letters, Honoris Causa from Cambridge College. Larry and his work have been featured on Oprah, Lehrer, Newsweek, and Forbes. He is an Ashoka Fellow, and a winner of the Ford Foundation Innovations in State and Local Government Award, and the McGraw Prize in Education. George Hart, an interdisciplinary sculptor, mathematician, computer scientist, and educator. George is a former research professor at Stony Brook University, and is a pioneer in using computer technology and 3D printing in the design and fabrication of sculpture. Examples of his artwork can be seen M.I.T., U.C. Berkeley, Duke University, Princeton University, and Stony Brook University. He has developed original education materials to incorporate 3D printing into the high school math curriculum, and has helped many teachers bring this work into their own classrooms. George is a co-founder of North America's only Museum of Mathematics. As chief of content, he set the "Math is Cool!" tone of the museum, and spent five years designing their original exhibits and workshop activities. Jessica Rosenkrantz and Jesse Louis-Rosenberg of Nervous System, a generative design studio in Massachusetts that works at the intersection of science, art, and technology. Writing computer programs based on processes and patterns found in nature, the studio creates unique and affordable art, jewelry, and housewares. Nervous System has pioneered the application of new technologies in design, including generative systems, 3D printing, and webGL, and regularly releases online design applications that enable customers to co-create products in an effort to make design more accessible. Their designs have been featured in WIRED, the New York Times, Forbes, and elsewhere, and their work is a part of the permanent collection at the Museum of Modern Art, the Cooper-Hewitt, Smithsonian Design Museum, and the Museum of Fine Arts, Boston. Dale Dougherty, CEO of Maker Media, who kicked off the event with the introductory Informal Education keynote. He recounted stories from his role in founding the Maker Movement as well as opportunities he sees at hand for the future of education – including strategies educators can use to deeply engage and transform the experience of students. Skylar Tibbits, founder and co-director of MIT’s Self-Assembly Lab, delivered the conference Higher Ed Keynote speech. He wowed audience with the progress of his research lab as it has introduced programming structure, behavior, and information into materials themselves – promising a future in which medical devices, furniture, buildings, and manufacturing facilities might be produced as emergent structures coded into smart materials. Sallye Coyle of ShopBot and Duke’s Osher Lifelong Learning Institute delivered the closing keynote. They focused on K-12 education, delving into the 21st century reinvention of “shop class”, and the importance of encouraging students and teachers alike to work with tools that deepen engagement and enhance creativity. Coyle’s extensive experience in STEAM education and her role in outfitting and constructing in-school and community makerspaces world-over provided attendees with a valuable look at the ingenuity that comes from experimentation and discovery made possible by access to and training with digital fabrication tools. Deanne Bell, an engineer, television host, and the founder of FutureEngineers.org, a platform that hosts national invention challenges for students. Dr. Jaydev P. Desai, a Professor in the Department of Biomedical Engineering at Georgia Institute of Technology and Director of RoboMed Laboratory. Prior to joining UMCP, he was an Associate Professor at Drexel University. He completed his undergraduate studies from the Indian Institute of Technology, Bombay, India, in 1993. He received his M.A. in Mathematics in 1997, M.S. and Ph.D. in Mechanical Engineering and Applied Mechanics in 1995 and 1998 respectively, all from the University of Pennsylvania. Prior to joining Drexel University, he was a Post-Doctoral Fellow in the Division of Engineering and Applied Sciences at Harvard University. He is a recipient several NIH R01 awards, NSF CAREER award, and was also the lead inventor on the “Outstanding Invention of 2007 in Physical Science Category” at the University of Maryland, College Park. He is also the recipient of the Ralph R. Teetor Educational Award. In 2011, he was an invited speaker at the National Academy of Sciences “Distinctive Voices” seminar series on the topic of “Robot-Assisted Neurosurgery” at the Beckman Center. He was also invited to attend the National Academy of Engineering’s 2011 U.S. Frontiers of Engineering Symposium. His research interests include image-guided surgical robotics, reality-based soft-tissue modeling for surgical simulation, grasping, haptics, and micro-scale cell and tissue characterization. He is also a fellow of the ASME and a senior member of the IEEE. Tom Gray, the CEO for Make48 and Senior Product Strategist for The Handy Camel. Make48 is a 48-hour event competition turned television documentary series on the American Public Television network about teaching how anyone who has a big idea can take it from napkin design to prototype to the consumer. Make48 is moving into education as Season 3's competition will be 12 colleges and universities from around the nation going head to head to head. Dr. Amy Hurst, an Associate Professor of Human-Centered Computing in the Information Systems Department whose research focuses on empowering technology, with projects investigating automatically adaptive interfaces and DIY-Assistive Technology. She is interested in working to help more people gain access to the Assistive Technology they need by empowering non-engineers to “Do It Yourself” (DIY) and create, modify or build. She received her PhD from the Human-Computer Interaction Institute at Carnegie Mellon, and a BS in Computer Science from Georgia Tech. Wayne K. Li, the James L. Oliver Professor, which is a joint position between the Colleges of Design and Engineering. Through classes and the Innovation and Design Collaboration (IDC), he leads joint teaching initiatives and advances interdisciplinary collaboration between mechanical engineering and industrial design. Endowed by School of Industrial Design alumnus James L. Oliver, II (BS ID 1965, ME 1967), the Oliver professor embodies the idea of "multidisciplinary." Li teaches students that design behavior bridges the language and ideological gap between engineering and design. Li’s research areas include ethnographic research, multidisciplinary online education, and human-machine interaction in transportation design. Previously, Li led innovation and market expansion for Pottery Barn seasonal home products, was an influential teacher in Stanford University’s design program where he taught visual communication and digital media techniques, led “interface development” in Volkswagen of America’s Electronics Research Laboratory, and developed corporate brand and vehicle differentiation strategies at Ford Motor Company. Jason Martin founder of Community Guilds Inc. in 2013 to transform public education. Through their work, kids tackle real problems, design solutions, get their hands dirty, and then, with community experts, build amazing innovations together. Community Guilds harnesses the power of the maker movement to provide apprenticeship learning and school-based programs that seek to ignite a love of learning in students and transform teaching in schools. STE(A)M Truck is the largest program offered by Community Guilds and served over 10,000 students in the 2017-18 school year. Jason is a former Teach For America corps member, with over 20 years of education reform experience. Jason has degrees from Rutgers and Columbia University but believes he learned the essential skills needed for success as a former mason's apprentice, Kindergarten teacher and Outward Bound instructor. He lives with his wife and two daughters on an organic farm in East Lake, GA.
Henry Segerman who received his masters in mathematics from the University of Oxford, and his Ph.D. in mathematics from Stanford University. He is currently an assistant professor in the department of mathematics at Oklahoma State University. His research interests are in three-dimensional geometry and topology, and in mathematical art and visualization. In visualization, he works mostly in the medium of 3D printing, with other interests in spherical video, virtual, and augmented reality. He is the author of the book "Visualizing Mathematics with 3D Printing". Dr. H Jerry Qi, Professor and the Woodruff Faculty Fellow in the George W. Woodruff School of Mechanical Engineering at Georgia Tech. He received his bachelor degree and graduate degrees from Tsinghua University and a Doctor of Science degree from Massachusetts Institute of Technology (MIT). After one-year postdoc at MIT, he joined University of Colorado Boulder as an assistant professor in 2004. He joined Georgia Tech in 2014 as an associate professor and was promoted to a full professor in 2016. Prof. Qi’s research is in the broad field of nonlinear mechanics of polymeric materials and focuses on developing fundamental understanding of multi-field properties of soft active materials through experimentation and constitutive modeling then applying these understandings to application designs. He and his collaborators have been working on a range of soft active materials, including shape memory polymers, shape memory elastomeric composites, light activated polymers, covalent adaptable network polymers, for their interesting behaviors such as shape memory, light actuation, surface patterning, surface welding, healing, and reprocessing. In recent years, he has been working on integrating active materials with 3D printing. He and his collaborators pioneered the 4D printing concept. Prof. Qi is a recipient of NSF CAREER award (2007). In 2015, he was elected to an ASME Fellow. Christopher B. Williams, an Associate Professor and Electro Mechanical Corporation Faculty Fellow in the Department of Mechanical Engineering at Virginia Tech. He holds affiliate faculty positions in the Department of Engineering Education and the Department of Material Science &amp; Engineering. He is the Director of the Design, Research, and Education for Additive Manufacturing Systems (DREAMS) Laboratory and Associate Director of the Macromolecules Innovation Institute (MII). His research contributions have been recognized by eight Best Paper awards at international design, manufacturing, and engineering education conferences. He is a recipient of a National Science Foundation CAREER Award (2013), the 2012 International Outstanding Young Researcher in Freeform and Additive Fabrication Award, and the 2010 Emerald Engineering Additive Manufacturing Outstanding Doctoral Research Award. He serves on the Additive Manufacturing Community Advisors for SME. Chris holds a Ph.D. and M.S. in Mechanical Engineering from the Georgia Institute of Technology (Atlanta, Georgia) and a B.S. with High Honors in Mechanical Engineering from the University of Florida (Gainesville, Florida). Marius Watz, known for creating art that highlights visual concepts through generative software processes, was a featured speaker at Construct3D. Drawing on experience inspiring audiences of designers, artists, and programmers alike at events such as the IO conference, his talk, “Strange Objects: New Expressions with 3D Printing and Code,” discussed ways that novel fabrication technologies enable innovative forms of expression in 3D printing and computational design. Autodesk product manager Guillermo Melantoni joined Technical Product Manager John Helfen and Autodesk’s Senior Manager, Youth Audience Strategy, Sarah O’Rourke, to offer a sneak preview into significant advances launching in upcoming product updates for Tinkercad and Fusion360. Another notable speaker, Lead Scientist Matthew Borgatti from Super-Releaser Robotics shared his approach to tackling challenging engineering problems using digital fabrication, and the approaches to research, testing, and rapid iteration that accelerates the production of successful products and solutions. Renown Grasshopper trainer Andrés Gonzalez introduced attendees to the Rhino3D software ecosystem, shedding a veteran light on data, design, and code through his dedicated involvement as the worldwide director of RhinoFabStudio, a digital fabrication professional community. SketchUp evangelist Eric Schimelpfenig presented his journey from “bad student” to passionately engaged maker. The CEO and co-founder of Structur3D, Charles Mire, drew on his background as a chemist and academic materials researcher, to share his efforts over the years to explore paste extruders and compatible materials. Research that lead him and his colleagues to band together to offer the Discov3ry paste extruder system, offered for Ultimaker hardware and compatible with a wide range of desktop 3D printers. Clemson professor Insun Kwon displayed his intricate designs at the Ultimaker booth, and introduced attendees to the techniques he has developed for fabricating his challenging, high-resolution, digitally-sculpted models using affordable desktop 3D printing technologies. The final panel of the event brought together a dream team of designers/engineers Matthew Borgatti, Sean Charlesworth, Michael Curry, Darlene Farris-LaBar, Eric Schimelpfenig, and Laura Taalman, moderated by Ultimaker’s Matt Griffin, to share real world experiences fulfilling challenge projects with clients and collaborators from an educator’s perspective. While team members from Ultimaker are co-founders of this conference, the Construct3D team has committed itself to making the event vendor agnostic, speaking to all of the approaches to desktop 3D printing and digital fabrication equipment, software, and materials in use by educators. We have committed ourselves to keeping this event open to all parties engaged in pushing the boundaries of 3D printing and digital fabrication in education. Exhibitors have included Autodesk, ShopBot, Essentium, Adobe, Apress, Proto-Pasta, Trotec, Fusion3, Shapeways, Formlabs, Aleph Objects, 3DPrinterOS, Carbide3D, Eastman and more. For the 2020 event, we have a great space for vendors to join the Construct3D family and share their industry expertise throughout the event.